Six establishments in Newmarket have committed to stay closed. Scanlon's bar are happy to be closed on Good Friday. ALL OF THE publicans in one rural town are going keep their doors shut and remain closed for business this coming Good Friday. 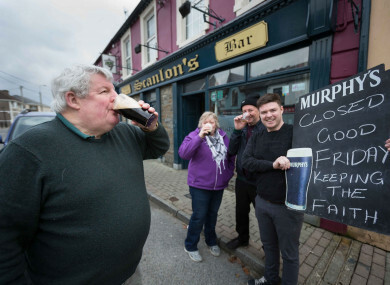 This follows the six publicans based in the north Cork town of Newmarket coming together and deciding collectively that they will not open their doors in spite of the state lifting the 91-year-old ban on pubs serving alcohol on Good Friday. According to the most recent census, Newmarket has a population of 976 and the move has received an overwhelmingly positive response from pub customers in the town. Publican Joan Hourigan has been serving pints from the behind the counter at Hourigan’s Bar on Newmarket’s New Street for the past 50 years. A mother of nine, five of her children are involved in the business and Hourigan said that she has always enjoyed a day out or decorating their shut pub on Good Friday “and I don’t want to give that up”. Hourigan said that the day off on Good Friday “is something that I cherish and a tradition I want to maintain”. She said that religion is playing only “a small part” in her decision to remain closed. Mick Hourigan, another publican in the village, announced the move to his customers on his pub’s Facebook page and the response from customers has been universally positive. Hourgian operates a bar and a nightclub in the village employing more than 20 people. Scanlon admitted that the decision to close can only work when all publicans in the area decide to close. Scanlon said that there has been no negative feedback from customers and the response has been positive. Another wrote “well done Newmarket, keep up our traditions” while one woman posted: “Well done to ye guys. Fair play. Our country needs to stand up for its traditions. Very proud that it is Newmarket leading the way – ‘we lead where others follow’”. Earlier this year, President Michael D Higgins signed into law the amendment to the Intoxicating Liquor Act that lifted the Good Friday pub ban that had been in place since 1927. Independent Senator Gerald Craughwell was a co-sponsor of the bill that has resulted in the lifting of the ban. “The bill was all about choice, especially for publicans and I fully respect the decision by the publicans of Newmarket to stay closed on Good Friday. It is very interesting that they have come together to do this,” said Craughwell. Craughwell said that he wasn’t approached by any vintners while the bill went through the Oireachtas. A spokesman for the Vintners Federation of Ireland (VFI) said today: “Like all other days of the year – except Christmas Day – publicans can choose to open or remain closed on Good Friday. The decision is entirely their own to make. Email “All the publicans in this Cork town plan on keeping the shutters down this Good Friday”. Feedback on “All the publicans in this Cork town plan on keeping the shutters down this Good Friday”.